Gothenburg is the second largest town in Sweden and a few miles on its outskirts lives Bengt Mörner. This engineer has two great loves in his life – Jaguar cars and fly fishing. His favourite salmon water is a small river not far from where he lives called Rolfsån. The best salmon pool on the river is located just upstream of a bridge which is supported in the middle by a concrete column. Catch a salmon and one thing is certain, once hooked it turns and heads downstream on the opposite side of the river and on the wrong side of the concrete column. The inevitable result happens, the salmon breaks off as the leader is snagged on the rough concrete. After losing many salmon Bengt realised that something had to be done, the problem was what? He consulted many old and wise fishermen on the river who told him that the only way to stop a salmon running downstream was to release the pressure on it very quickly. Usually the fish would then stop, turn and head back upstream at great speed. This presented another problem – lots of slack line that had to be retrieved quickly in order to avoid tangles. So having understood the problem and come up with a solution Mörner discovered that there was no reel available on the market to do the job. 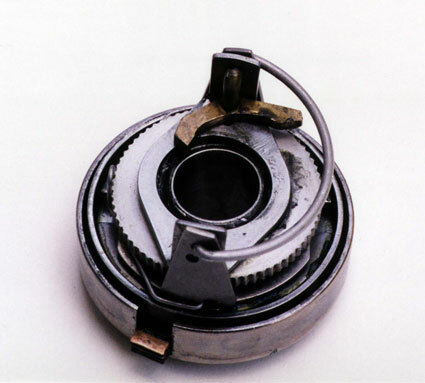 This was in the late 1960’s so the engineer within Mörner decided to design his own reel with the following features a brake mechanism capable of being adjusted to zero instantaneously, and multiplying action. Many trials took place before the first working prototype was available in the early 1970’s. Time to get things on a more business like footing. 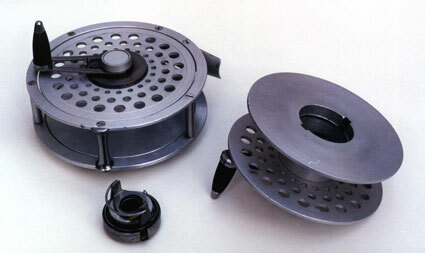 The reels were available in two sizes, trout and salmon. The trout weighed 7 ounces, 3½ inch diameter and with a 4/5 inch wide spool. It could hold a WF7 line with 150 yards of 20lbs Dacron backing. The salmon size weighed 8.1 ounces, 4 inches wide with a 1 inch wide spool. It held a WF11 line with 150 yards of 20lbs Dacron backing. The design of the reel was stunning and each time I see one I am amazed at it’s classic lines, even such a minor thing as the handle. Both reels were made from stainless steel, anodised aluminium, high quality bronze and nickel plated. It had a gear ratio of 1:2.14 with a maximum drag setting of 2 pounds. The handle was of the anti-reverse type so that it would not rotate when a running fish was taking line. To release the drag on the line and consequently the pressure on the fish, all you had to do was pull the crank backwards. 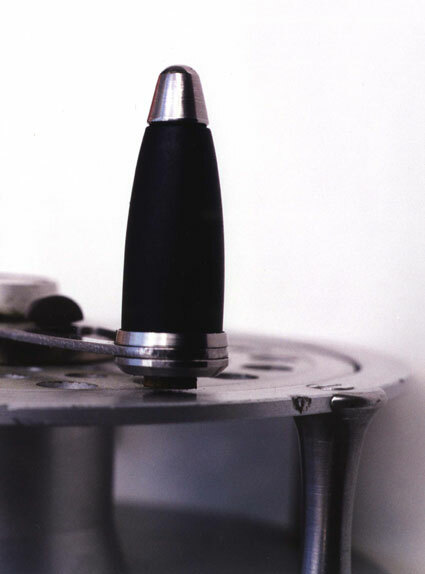 Additional drag could be applied to a running fish by use of the crank handle. The handle was made of spring steel and had a brake pad fitted on the base that acted against the spool. So how did the drag mechanism work? When the handle is turned backwards the catch, (fig. 20) locks in the backstop (fig. 46), this in turn tightens the spring (fig. 45). The catch (fig. 20) is also connected to the lever (fig. 16) by the loop (fig. 18). 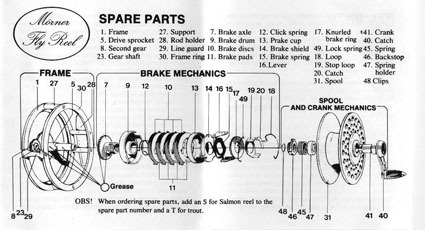 This acts on the brake spring (fig. 15) and releases the disc brakes (figs. 10 and 11). Thus facilitating a step – less drag system. By releasing the handle the spring (fig. 45) returns the brakes to their original position. In the instruction leaflet there is a very interesting section on drag adjustment. It says that if you try and adjust the setting and all the parts end up in your hand just reassemble them as per the drawing. Guess what? Yes it fell apart and all the bits ended up in my hand, I did manage to get the mechanism back together eventually! The original reels were assembled by a company called AB Aero-Telaw Atew in the small Swedish town of Flen. Later this company, which was mainly involved in shipbuilding, manufactured the reels under license. However the recession that hit the worlds shipbuilders in the 1970’s forced the winding up of the company. 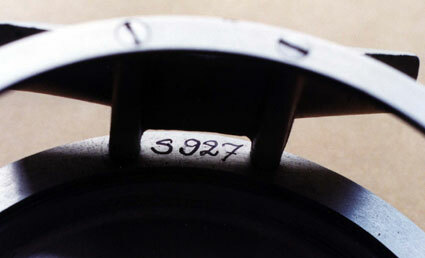 Detail of the serial numbers on Morner reels. Serial number written inside the rim near the rim seat “S” for salmon. Launched on the market it enjoyed limited success due to two things. It was a complicated reel and it was expensive. All the reels are individually numbered and in the period 1976-77 nearly 4,000 Mörner reels were made. They came in two sizes with approximately 10% more being in the salmon size. Nearly 1,000 of the reels were exported to USA where the Orvis company sold them as the Orvis Lord I and the Orvis Lord II. They were dropped from their catalogue in 1980. Mr. Mörner owned a company in America in the town of Frankfort Illinois and plans were in hand to move the manufacturing of the reels there. A surge in the exchange rate of the dollar against other currencies ended this idea. In the early 1990’s the Mörner reel was resurrected when Mr. Mörner decided to try and resolve the problem of his large stock of spares. 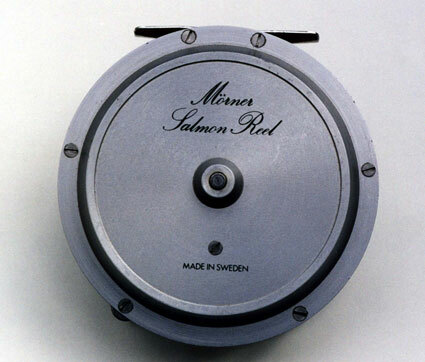 The Mörner reel European version sold by Normark. 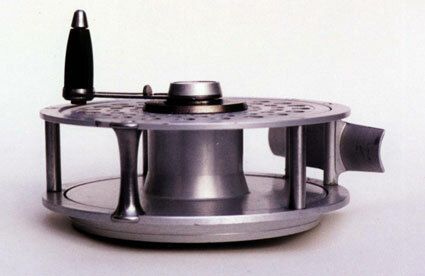 He sub – contracted a specialist engineering company to manufacture all the missing parts needed to make a complete reel. He assembled them himself and about 200 were put together before he realised that every time he sold a reel he was making a loss. The production cost was in excess of the retail price and the Mörner reel project was definitely ended. Today these reels are highly sought after by those fishermen who have used them. They are trying to buy up all the spare ones before the secret of this wonderful reel is divulged to the rest of the world. I have only seen four of these reels in the past ten years. Whenever I have bought them I have always had stiff competition. The Mörner reel – an all time classic. As for Bengt Mörner, when he is not playing with his Jaguars or fishing he is more than willing to service your reel. This reel was made by me but I did not tell anyone. This entry was posted in Morner Reel and tagged Add new tag, morner fishing reel from sweden. Bookmark the permalink. 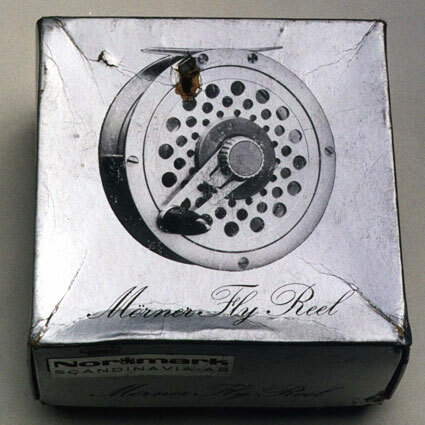 I own one of these reels….How do I contact Mr. Morner? This a superb article on a superb reel – I have the good fortune to have both the trout and salmon reel and i fish them both with the utmost of pleasure. These are some of the worlds greatest reels and i urge you to buy one if you ever get the chance. I own the salmon reel. to a left hand retrieve ? What was the MSRP on the LordII fly reels, and what are they going at on auction now? 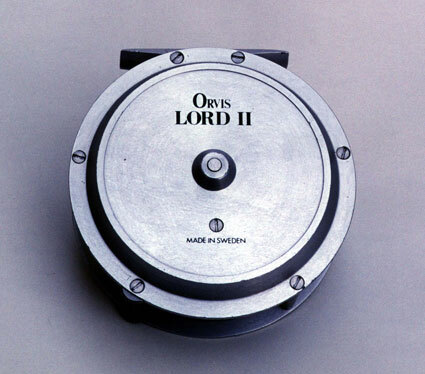 What was the original cost of the Orvis Lord II fly reel when new? je possède un Morner Trout, très bon état dans sa boite d’ origine, possible vente ou échange. 1. Where is the serial number located on the Trout Reel? 2. Does anyone have any current location information on Mr. Morner? Hi there the serial number is usually on the inside rim near the foot. I believe Mr Morner is still based in his home town in Sweeden. Is it possible to change the retrieve from left to right? Question: is it possible to set the morner reel from clockwise to counterclockwise, or vice versa? Answer: yes that is possible, then you have to catch part 20 (catch) of the brake mechanism, which is the brass catcher for the brake. So if the short side is first facing down, you have to make sure that the long side is facing down, it is some work but it works.